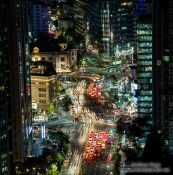 With images from the modern capital Seoul, home to more than 10 million Koreans. The images depict everyday life and show some of the iconic views of the city. This gallery shows the traditional face of Seoul. The history of Seoul dates back over 2,000 years which is reflected by its rich architectural heritage which includes the Bukchong Hanok village or the UNESCO world heritage sites at Changdeokgung palace and Jongmyo shrine. With images from the Haeinsa temple complex. Built in 802, Haeinsa is an important buddhist temple of the Jogye Order located in the Gaya Mountains. Since 1398 it houses the Tripitaka Koreana, the entirety of Buddhist Scriptures carved onto over 81,000 wooden printing blocks. Both the temple and the depositories for the Tripitaka Koreana are on the UNESCO World Heritage List. With images from the Camellia Island in the Jangsado Sea Park, a popular holiday destination on the southern coast.